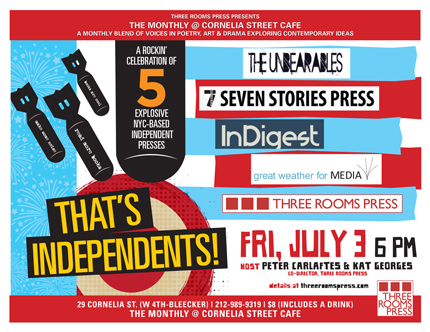 Home→The Monthly at Cornelia Street Cafe→That’s Independents! Each of the five publishing companies represented will discuss their publishing ethos—and what sets them apart—then present work by some of their current authors. Presses include: The Unbearables, InDigest, Great Weather for Media, and Three Rooms Press. InDigest is an online literary magazine and arts blog focused on creating a dialogue between the arts. While we publish on a quarterly schedule, we update our blog and podcasts regularly. InDigest recognizes that art does not take place in a vacuum and that categories are meaningless. We are interested in work that cannot be classified by genre, in good story-telling in all forms, and in artists whose curiosity drives them to push beyond the conventions of their media. InDigest also presents the InDigest reading series that takes place monthly in New York.